My West Point classmate, Colonel (Ret.) Bill Haponski, and I have authored a new book that was published March 15 by Casemate Publishers. The title is Autopsy of an Unwinnable War: Vietnam. Bill was S-3 and XO of the 11th ACR in 1968, and he subsequently commanded the Quarter Cav in the 1st Infantry Division. At the same time he was with the Quarter Cav, I commanded the 2/5 Cav in the 1st Cavalry Division. This link is to the hardcover version; an e-book version will be offered in the near future. 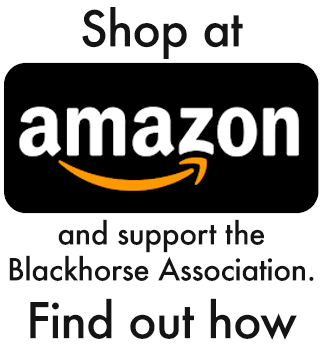 2019 Reunion Update –Las Vegas, Nevada Reunion registration information: All registration and reservation information & forms can be found on our Blackhorse Association website at www.blackhorse.orgopens in a new window. Registration can be completed by mailing the registration form to AFR or registering online at www.afr-reg.com/Blackhorse2019opens in a new window. The cut-off for registration and reservations is May 1, 2019. We are hopeful you will complete your registration early because we are expecting a large crowd. We have two registration rates this year. You may register for the entire event (both Friday and Saturday evening meals included) for $148 per person; or you could register for Friday OR Saturday night only for $118. If you will only be attending one night, please buy a meal for the night you will be attending. Don’t forget to buy your poker chip! ($6). Rooms are blocked from July 11-15. If you have base clearance (retired military or 100% service-connected disability), there will be no more for you to do once you reserve your room. Otherwise, we need to get your information for base access. Contact Walter at 716-392-7916 as soon as you make your reservations. For any questions, please phone Walter at 716-392-7916. ___________________________________ Blackhorse NCO and Soldier of the Quarter, 4th QTR, 2018 Staff Sergeant Ramin S. Ott, NCO of the Quarter SSG Ramin S. Ott was born June 22, 1989 in Pagopago, American Samoa, the son of John and Tausaili Ott. He has been happily married for 8 years and is blessed with four daughters. He attended and graduated from Tafuna High School in June 2004. Ott traveled the Pacific islands as part of the American Samoan National Soccer Team before deciding to join the U.S. Army out of Mesa, Arizona in January 2010. He started basic training in January 2010 at Fort Knox, Kentucky. He then continued his advanced individual training as a light wheeled mechanic (91 B) at Fort Jackson, South Carolina. After completing entry level training, he was assigned to Echo Company 3/2 General Supper Aviation Battalion at Camp Humphreys, South Korea in July 2010. After a year in Camp Humphreys, Ott was then assigned to Fort Campbell, Kentucky with the 101st Airborne Division (Air Assault), where he served as a wheeled vehicle mechanic for Echo Company, 5th Battalion 101st Aviation Brigade. While there, he did a tour in Bagram, Afghanistan for 7 months, graduated from the Sabalauski Air Assault School, completed the Warriors Leader Course, and was promoted to the rank of sergeant by the end of his time in Fort Campbell in 2013. 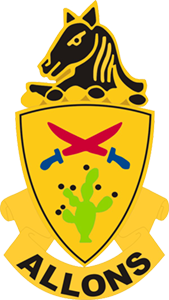 In October 2014, SSG Ott was assigned to HHB Division Artillery, 25th Infantry Division, Schofield Barracks, Hawaii, where he helped stand up the battery motor pool and arms room. SSG Ott took initiative to write up not only the Scheduled Service SOP for the motor pool but the SOP for the unit arms room as well. Prior to reporting to Fort Irwin, Ott completed Advanced Leaders Course. SSG Ott is section sergeant for the Automotive Section in Maintenance Troop, RSS, 11th ACR, and he serves as the Troop’s Master Driver and UPL. SSG Ott has operated in different positions in motor pool operations and has yet to be a motor sergeant in one. One of his goals is to be afforded the opportunity to do so and do so successfully. SSG Ott recently won the Squadron NCO of the Month. SSG Ott’s goal is to successfully complete his Army career, retire as a Senior NCO, and make leaders along the way! SPC Medina was born in San Antonio, Texas on February 27, 1996 and grew up in San Antonio, Texas. He graduated in June of 2013 from Sandra Day O’Connor High School. He attended Northwest Vista Community College in San Antonio, Texas where he received his Associates Degree. He enlisted in the United States Army in May 2017 to become a Healthcare Specialist. SPC Medina attended Basic Training in Fort Sill, Oklahoma and Advanced Individual Training at Fort Sam Houston, Texas, earning the MOS of 68W. SPC Medina received orders upon graduation to 2nd Squadron 11th Armored Cavalry Regiment. SPC Medina’s duty assignments include: Field Litter Ambulance driver for the Evacuation section for the 2111th Medic Platoon and a line medic for the mortar platoon; he is currently assigned as a junior line medic for Fury Troop 2/11 ACR. SPC Medina also won the February 2019 Soldier of the Month Board. His short-term goals are to earn the Expert Field Medical Badge, and he wants to attend Air Assault and Airborne schools and SFAB. In addition, SPC Medina wants to become ranger qualified. 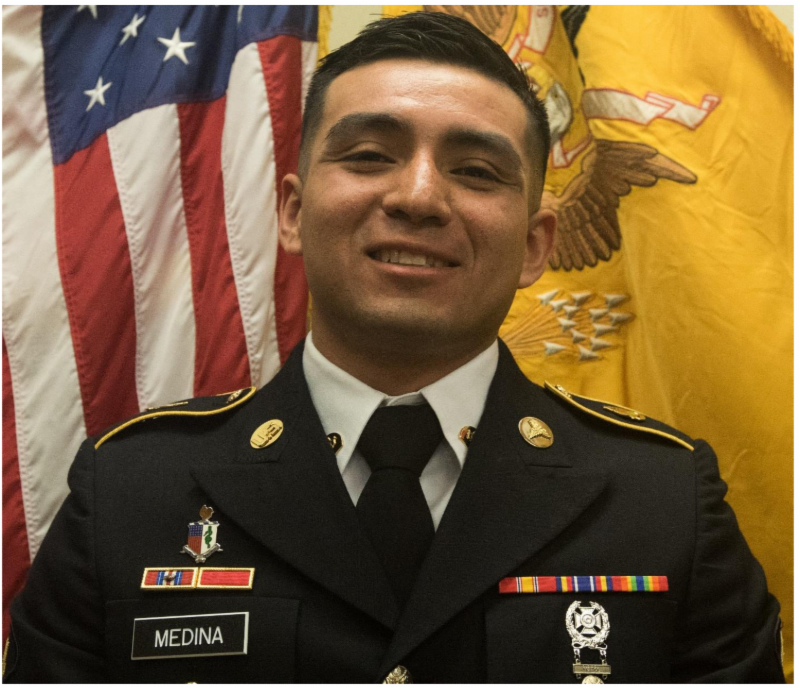 SPC Medina also hopes to earn his Bachelor’s Degree in Business Administration. His long-term goals are to become a first sergeant, earn a master’s degree in business administration with a focus in accounting, and own his own physical therapy clinic.